For more than twenty years I’ve talked about the effects of commoditization and working with small and mid-market companies to grow revenues and margins despite commoditization. In Beyond Price, I share the importance of focusing on establishing the intelligence and enterprise value of your company to support margin expansion. As we’ve been rolling these ideas out to our clients and to their salespeople, we see a common area of resistance in the belief that, regardless of what you do, customers are going to increase the pressure they place on your price. In fairness to that argument, I completely agree. No matter what you do, pricing pressure is going to increase. 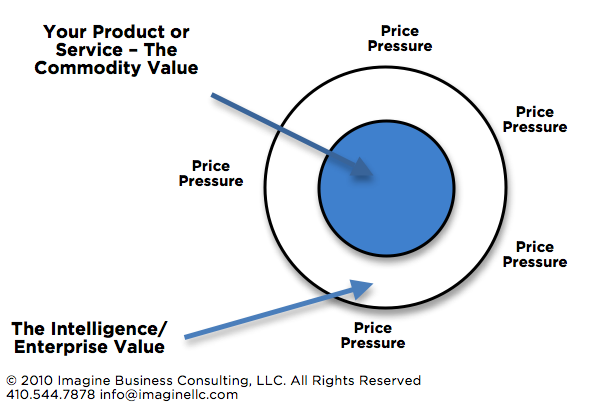 The question is where do you want that pressure – on your core product or service, (the commodity) which has, by definition, less margin or on the account value you bring, which is where you margin premium lies? When your value proposition is effectively focused on your account value, it serves as a moat protecting the margins of your commodity. In my experience, if a small or mid-market company fails to build that moat, trouble lies ahead.